"Deconstruction" is a cooking term to describe a dish where ingredients that are normally combined are instead prepared separately, providing a better showcase for their distinctive flavors and textures. I see the term applied to desserts often, but it can done for other dishes too. For years, I experimented with ways to deconstruct green bean casserole, although I was never satisfied with the results. I find a typical green bean casserole to be rather drab, and I thought that deconstructing the dish could allow its ingredients--fresh green beans, crispy onions, mushrooms--to shine, but I was never satisfied with my attempts. Instead, a couple years ago, I came up with a recipe for Green Bean Casserole with Bacon and Mushrooms that improved, rather than deconstructed, the dish. So now I'm taking aim at another Thanksgiving casserole that I think could use a lift--the sweet potato casserole--and this time I'm back to deconstruction. 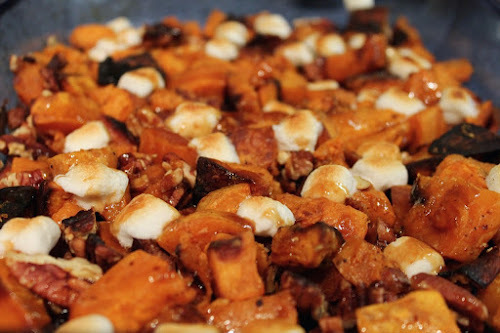 Let's consider the problems with a typical sweet potato casserole: it's too sweet, with a puree of sweet potatoes, which, as their name implies are naturally sweet but have added refined sugar anyway, and topped with a thick layer of broiled marshmallows (which are almost all sugar). Texturally, it's like lazy mashed potatoes, and isn't one starchy puree enough? My goals for this dish were to 1) give the dish more body and texture, 2) dial back on the sugar and make what sweetness I did add to the dish more interesting, 3) make the potatoes the star attraction. In short, I wanted to make the dish more like the side dish it should be and less like the faux-dessert it often ends up being. To that end, instead of making a sweet potato puree, I roasted the sweet potatoes, keeping them in lightly browned bite-size chunks. I reduced the amount of sugar and, instead of white sugar, I used a more savory combination of brown sugar and maple syrup, forming a glaze similar to that from the recipe for Roasted Sweet Potatoes with Bourbon-Maple Glaze. I also dialed the marshmallows way back so that they dot the top of the dish rather than form a thick layer concealing the potatoes. Bacon and pecans add further savory and smoky notes to the dish (and the bacon may be omitted to make the dish vegetarian). 1. Arrange racks in upper and lower thirds of oven and preheat to 425° F.
3. Cook bacon in a medium frying pan over medium heat until brown and crisp. Set aside on a paper-towel-lined plate to cool, the crumble into large bits. 4. Heat a small frying pan over medium-low heat. Toast the pecans, tossing frequently, until fragrant (shouldn't take more than about 10 minutes). Transfer the nuts to a cutting board, allow to cool slightly, then coarsely chop them. 5. In a medium (2 to 2 1/2 quart) saucepan over medium-high heat, combine maple syrup, water, brown sugar, soy sauce and ginger. Bring the mixture to a boil and cook until thickened and reduced by half, 6-7 minutes (watch and stir often to prevent burning). Stir in the bourbon and butter, reduce heat to medium-low and simmer until the sauce is reduced to 2/3 cup. Set aside. 6. Preheat oven broiler with rack about 4-5 inches from broiler. Combine sweet potatoes with bacon and pecans and transfer to lightly oiled 9 X 13 baking dish. Top the mixture with marshmallows and broil to brown the marshmallows, about 1 minute (watch to prevent burning, more or less time may be needed). Drizzle the casserole with the maple-bourbon sauce.